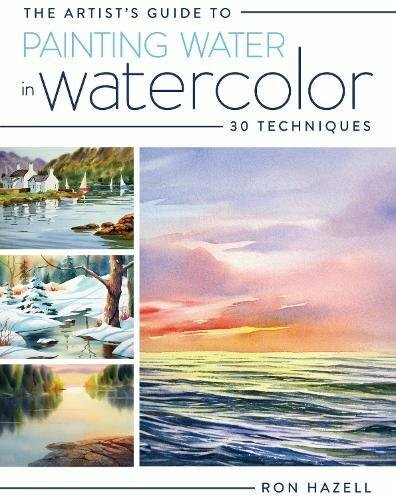 If you find it challenging to paint water with watercolour, this is the book for you. Ron Hazell has been giving painting workshops for 35 years so this guy is incredibly experience, and you can probably tell by the beautiful examples in this book too. He's best known for marine paintings but he paints a wide variety of subjects as well. This is a very hands on book. Right after talking about the tools and colours you need, it jumps straight into the tutorials. There are 30 step by step tutorials included that covers different types of water. There are example on how to paint ripples, reflections, reflecting light, harbour, lakes, oceans, crashing waves, waterfalls, beach, clouds in the horizon, snow and fog. It's that comprehensive. The instructions are clear and easy to follow. The best part about the book is it explains the why very thoroughly. Like why do you have to paint water in a certain why, what colours to use and why those colours are used, how one should tackle water subjects. This is a book worth revisiting often just to nail down those techniques. Highly recommended. The book I have is a review copy provided by North Light Books.